Rep. Dan Bartel (left), R-Lewistown, and Rep. Kenneth Holmlund, R-Miles City, are working on legislation together to address the possibility of bison moving into central Montana. Photo by Shaylee Ragar / UM Legislative News Service. 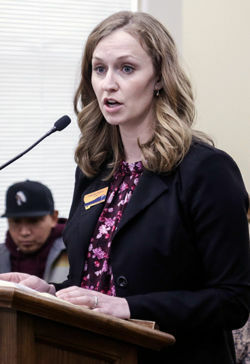 Chelcie Cargill represents the interests of the Montana Farm Bureau Federation at a committee hearing for a bill that would allow bison to be transferred from Yellowstone to the Fort Peck Indian Reservation on Mar. 21, 2019. Some argue bison are a critical cultural, spiritual and historical resource. Others argue bison pose a threat to the health and well-being of cattle. Now, legislators are considering a number of bills that would decide where bison are allowed to graze, and which government entity gets to make that decision. “Our beautiful state is embroiled in a management conundrum,” Runningwolf said when he presented his bill in committee last week. Bison populations were decimated in the early 1800’s as Europeans moved west, according to the U.S. Fish and Wildlife Service. Native Americans had been hunting bison for centuries. Their hides and meat were staple resources for tribes, which became scarce when hunting bison became a sport for settlers rather than a necessity. In 2019, bison are confined to certain areas in the state. Some ranchers feel strongly about keeping bison in these areas because they’re carriers of brucellosis, a disease the affects bison, cattle, elk and humans. It can lead to high rates of abortion in cattle, bison and elk. Researchers have not been able to document a transmission of brucellosis from bison to cattle in the wild, although it is possible. According to the Department of Agriculture, more than 50 percent of bison in Yellowstone have tested positive for the disease. House Joint Resolution 28 urges the federal Bureau of Land Management to deny American Prairie Reserve’s (APR) request for a year-round grazing permit that would cover land in Chouteau, Fergus, Petroleum, Phillips, and Valley Counties. It passed the House 59-40 and was heard in a Senate committee last week. The Bozeman-based conservation organization owns this land, and argues HJ 28 is an attack on private property rights. However, the lawmaker sponsoring the bill says he believes bison grazing will affect private property of ranches in the area. Rep. Dan Bartel, R-Lewistown, is carrying the resolution and said it’s “critical to the well-being of Montana’s livestock and wildlife.” Bartel said ranchers have implemented best practices for soil and grazing management, and that it would be counterproductive to allow this new grazing permit. Former Montana Senator Ed Butcher from Winifred testified during the Senate committee hearing. He said he thinks APR wants to “eliminate” agriculture in the state. “This has nothing to do with property rights, it has to do with the future management of agriculture,” Butcher said. Proponents also expressed concerns about the reserve’s bison transmitting brucellosis to cattle. Pete Geddes, vice president and chief external relations officer for APR, said the argument of brucellosis transmission is a red herring. “This is a matter of science, not opinion,” Geddes said. Geddes said APR gets domestic bison from Canada that are brucellosis free. The bison will be contained in a fenced area, and as for the grazing concerns, Geddes said, APR has developed a peer-reviewed bison management plan that will ensure grazing doesn’t damage the land. Geddes argues the resolution itself is oversteps government authority, and said as much in the bill’s hearing. “It is surely not lost on members of this committee that this resolution seeks to use the power of the state to attack the property rights and grazing privileges of a private entity doing business in Montana,” Geddes said. Before the resolution was debated on the House floor several weeks ago, this exact argument led to an emergency meeting of the House Rules Committee, which establishes how the lawmaking body will conduct business. Some argued the resolution set a bad precedent. However, the committee ultimately decided the resolution could move forward. It would not actually change state policy if passed. A bill passed by the House would give county governments some say in whether or not bison are moved around the state. Rep. Joshua Kassmier, R-Fort Benton, is sponsoring House Bill 332 in an attempt to give local officials “a seat at the table” when it comes to deciding bison transfers into Montana. The bill would require the Board of County Commissioners to first authorize any request from the Department of Livestock or the Department of Fish, Wildlife and Parks before wild bison are released into any county. “The ranchers are getting nervous. (American Prairie Reserve) is buying up a lot of ground,” Kassmeir said. Kassmeir said he’s particularly worried the bison will overgraze the land. He said it takes years for grasses to regrow and that it makes it easier for noxious weeds to spread. Tribes would be exempt from the ordinance. Whether or not this could affect the APR grazing permit is unclear because its bison are domestic. The bill passed out of the House on a tight vote -- 56-41 in late February. It will move to the Senate Agriculture, Livestock and Irrigation next. Runningwolf, the representative from Browning, is asking for a state policy change with House Bill 478. It would revise laws related to transferring wild bison to tribal entities, allowing bison to be transferred from Yellowstone to tribal lands before the bison have received brucellosis-free certification. The Fort Peck tribes have built a quarantine facility on their land. “I am a descendant of buffalo hunters. We’ve done it for thousands and thousands of years, and we knew how to manage them,” Runningwolf told the House Agriculture Committee. The Fort Peck Indian Reservation’s quarantine facility has received five new bison bulls from Yellowstone in February. Runningwolf said bison are an economical, spiritual and cultural resource for Native Americans. And, he said, tribes will take them dead or alive, because they want the meat and hides. His bill would also require the Department of Livestock to donate bison carcasses to tribes or charity. Majel Russell is legal counsel for the Fort Peck Assiniboine and Sioux Tribes. She talked to the committee about the historical significance of bison for natives. When bison were brought to near extinction in the 1800s, she said, it was part of an effort to wage war on Native Americans and push them off the land they’d been on for centuries. By killing bison, Europeans expanding West were also killing off Natives’ food source. “It correlates with the attempt to exterminate the Indian people,” Russell said. Russell said that even though reservations are sovereign, the tribes are willing to working with state and federal officials to ease worries. The facility is located in the middle of the reservation and enclosed by fence. Russell said there’s no reason the transfer should not take place. Again, farmers and ranchers disagree. Opponents included the Montana Stockgrowers Association, the Montana Farm Bureau and the Montana Farmers Union. Chelcie Cargill, representing the Montana Farm Bureau Federation, said during testimony that bison pose a serious threat to the livestock industry. “This really has nothing to with tribal entities growing bison populations, it has everything to do with disease management,” Cargill said. Jay Bodner with the Montana Stockgrowers Association said the threat of disease is not only concerning if it affects cattle, but that the potential would hurt the state’s export of beef. He said he believes allowing for the transfer will cost the state millions of dollars in mitigation costs. Runningwolf, a cattle rancher himself, disagrees with this assertion. He said demand for red meat is high, and that’s not going to change. He said he’s tired of the barriers reservations face and the implication that the tribes won’t adequately manage the bison. He said this a goal tribes have been working toward for a long time, but that there have been roadblocks. “I think we’re good neighbors, we’re strong conservationists,” Runningwolf said.